The Society of Saint Tammany, founded in 1789 in New York City, is named for Tamanend, a chief of the Delaware tribe. It started out as a patriotic and charitable organization, created by tradesmen who weren’t allowed to join the more exclusive clubs that the wealthy belonged to. As wave after wave of new immigrants arrived in New York City during the 1800s, Tammany gave them a helping hand with food, shelter, and jobs. Meanwhile, the Tammany politicians were building an enormous base of support by organizing immigrants into a voting bloc. 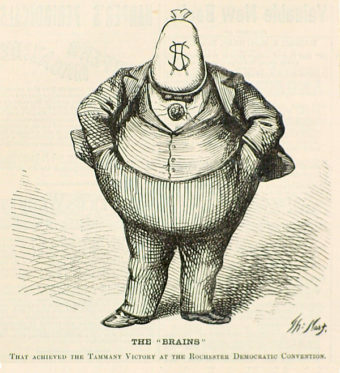 By the time Boss Tweed came along, the society had evolved into a well-oiled political machine that was known as Tammany Hall after its headquarters (aka its “wigwam”) on East 14th Street. 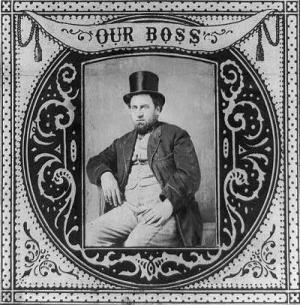 William Marcy “Boss” Tweed was born in 1823 on the Lower East Side of New York City, an immigrant neighborhood that was the traditional starting point for new arrivals in the United States. Tweed never talked about his ethnic background—probably because it served his political interests to keep it ambiguous. After public school, Tweed became an apprentice chair maker. Later he became a bookkeeper and a volunteer fireman, because the fire department was a traditional gateway into politics. Before you know it, Tweed was captain of his local fire company—and was busily building a power base in Tammany—and then in the Demo cratic Party, which got him elected as a city alderman in 1851. Once he’d worked his way to the top of Tammany, becoming its grand sachem, Tweed bribed officials and openly bought votes to put his cronies into nearly every elected and appointed office in the city and the state. New York City became completely controlled by the Tweed Ring. He used his influence with state politicians to pass legislation that shifted power away from the state and toward New York City. He finagled the passage of the New York City charter in 1870, which gave him and his associates the final say concerning all city expenditures. New projects (buildings, parks, sewers, docks, street improvements) provided plenty of opportunity for graft—especially for Tweed himself after he started his own companies and made sure the city did business with them. Tweed shrewdly exploited the turf wars between Irish, Scottish, and Dutch gangs. He used them to eliminate or intimidate people, and to round up voters on election day and force them to vote the way he wanted them to. He used an elaborate system of bribes to control judges, the police, and other officials, and he bought favorable coverage in the press. Tweed seemed unstoppable, until one lowly county bookkeeper, unhappy with his cut of the graft, handed over some incriminating documents to the New York Times. The Times published a series of articles about huge cost overruns in the construction of the Tweed Courthouse, which was supposed to cost only $500,000 (407,000 euros) but ended up costing the city $13 million (10.5 million euros). Thomas Nast, the political cartoonist for Harper’s Weekly, created scathing cartoons depicting Tweed as thief, a convict, and an enormous glutton. Tweed tried to bribe Nast and the publisher of the Times to leave him alone, but they turned him down. Reform groups and disaffected Democrats demanded that he be held accountable. Prosecutor Samuel J. Tilden traced money directly from contractors to Tweed’s bank account; but when Tweed was brought to trial, the case resulted in a hung jury. Tilden was sure that Tweed had bribed the jurors. So when he retried the case, he assigned one police officer to guard each member of the jury, another police officer to watch the first one, and a private detective to watch both of them. Tweed was found guilty of failing to audit claims against the city, and he was convicted on charges of forgery and larceny. The ex-Boss was sentenced to 12 years in jail, but that was later reduced to one year. When he was released, the city sued him for $6 million (5 million euros). Tweed was jailed again, but he was allowed to visit his family every day, accompanied by a guard. 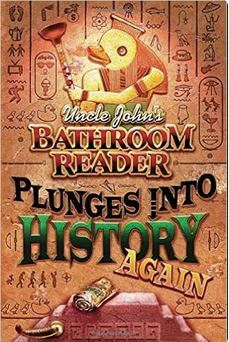 During one of those visits, he managed to escape. Tweed fled to Cuba and then to Spain, where he was working as a common seaman on a ship when someone recognized him from one of those Thomas Nast cartoons. He was sent back to his jail cell in New York. Very ill in his final months, he wanted to die at home instead of in jail. He offered to reveal everything he knew about Tammany Hall in exchange for a parole. But his offer was rejected and he died in jail in 1878. Samuel J. Tilden’s reputation as a reformer launched his political career. He was elected governor of New York and nearly won the U.S. presidency in 1876. In fact, Tilden won the popular vote that year, but lost by electoral votes to Rutherford B. Hayes. Tammany Hall continued to control much of New York City politics till the 1920s, and it was still influential in local politics into the 1960s. But when civil service reforms eliminated patronage and welfare became a function of government instead of social clubs, average people didn’t need organizations like Tammany Hall anymore. As its membership declined, so did its political influence. The club finally disbanded in the 1960s; today the “wigwam” is the home of the much more respectable New York Film Academy. As of 2002, the Tweed Courthouse became home to the New York City Board of Education.